If anyone ever tells my mother that I am taking pictures of my feet and putting them on the Internet, she will absolutely faint, even though after forty-mumble years of my existence, she should be accustomed to this sort of oddity coming from me. And it will do no good whatsoever to inform Mom that a great many other people in this world regale the Internet with photos of body parts far more alarming than feet. Nor will it do any good to tell her that all the other knitters are putting pictures of their own be-socked feet on the Internet. "All the other kids are doing it" didn't work in high school, either. But anyway, here are my feet. Mom, please note that they are very modestly encased in wooly socks. You canot tell from the still photo, but I am wiggling my toes in delight. 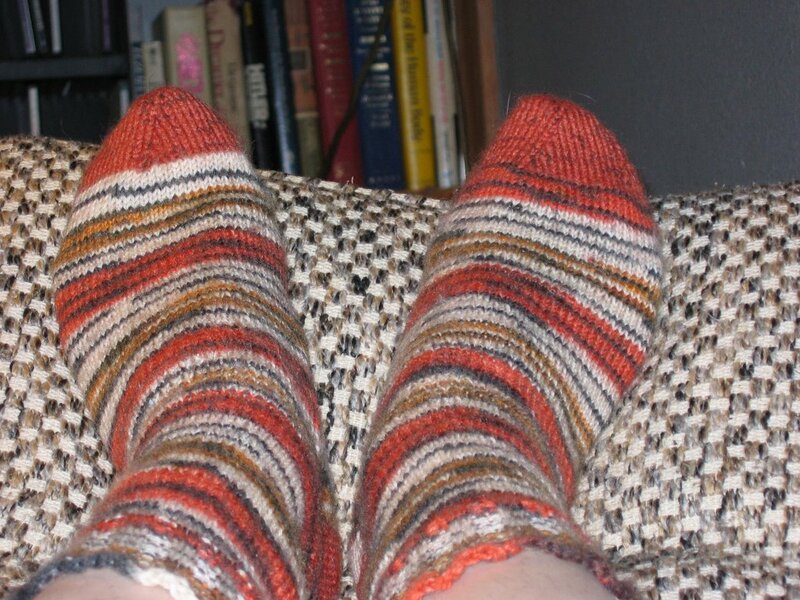 I am pickled tink and deeply honored to report that I have received this gift of a very special pair of Tiger Feet from Master Sock-Knitter Joan Richardson of Baton Rouge. 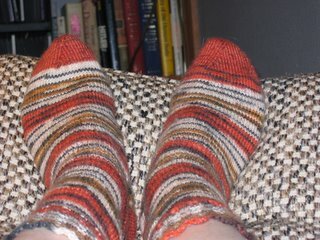 Although these are made from the new, more truly tiger-colored version of Opal Tiger, these are no ordinary socks. Only people who have knee injuries, specifically a torn AL, get a pair of these socks from Joan, and that honor has, to date, been reserved only for women on the LSU women's basketball team. 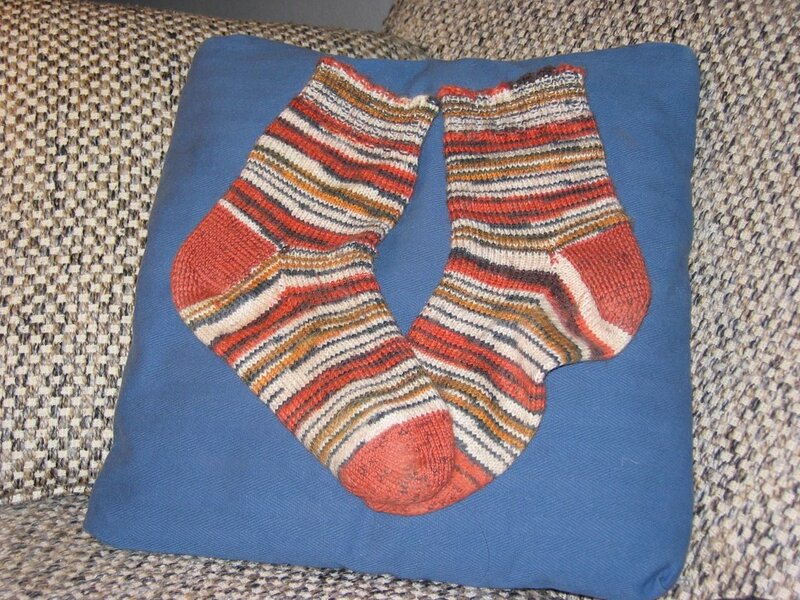 However, having managed to injure my knee and damage an AL this summer (see my earlier post in the archive from this past summer: Knit One, Patella Two), Joan has decided that I deserve a pair of these magnificent socks. 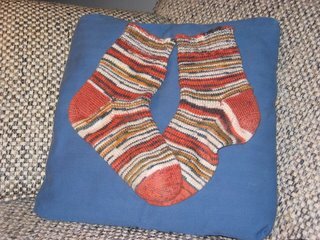 Joan, I am delighted with these socks and wish to thank you in public, on the Internet, for this wonderful gift. I plan to wear them on game days for the LSU women's basketball team for good luck for the team and of course during LSU baseball games as well. What, you may ask, is a Jupiter Gravity Couch? That is a perfectly reasonable question, which deserves a perfectly reasonable answer. The Jupiter Gravity Couch began as a sturdy, well-made sofa bed with a comfortable mattress but a poorly made pull-out metal bedframe. When after much use, it finally twisted into a pretzel and firmly refused to fold back into the couch, I simply disassembled it, tossed the frame at the curb, folded the mattress into thirds, and placed it in the gaping rectangular hole left behind by the previous mattress-frame combo. But oops! Being frameless, the folded mattress was far too shallow when the seat cushions were replaced. So, I inserted a thick chunk of sofa-seat-sized furniture foam, wisely covered in plastic, at floor level, and place the mattress on top of that. Another layer of furniture foam was placed atop that. And finally, the seat cushions were put in place. I have achieved Jupiter Gravity on Earth. Once you sit -- or worse, lie down upon -- this couch, it is physically impossible to get up. So. It is Sunday afternoon. I have some important decisions and plans to make this afternoon, which I shall announce to all of you very soon. I think I will retire to the Jupiter Gravity Couch for awhile now, to sit and contemplate my future. So-o-o cool! I remember when Joan snagged that Tiger Opal - it was hard to come by, even then. I'm glad, all-be-it sorry you qualified by injury, that you got a pair!